Denis Preston pops up with alarming regularity in Enlightenment!- the current edition of YHO which can be downloaded here. I have to confess it is only recently that it has dawned on me quite what an important role Denis played in the development of British popular music. His name features in so many remarkable stories, and yet it is only when you do a historical patchwork exercise that the true significance of this hits home. So, yeah, there’s plenty of mentions of Denis in Enlightenment! What is Denis best known for? Probably nowadays as the man who gave Joe Meek his big break as an engineer in the ‘50s, giving him plenty of freedom to experiment with the mixing desk, until Denis’ patience ran out and he sent Joe out into the big wide world. Even that story has a sub-text of Denis as pioneering independent producer setting up his own (Lansdowne) studios in Notting Hill, and what was he doing when he finally ran out of patience with Joe? Making a record with Kenny Graham and Joe Harriott! 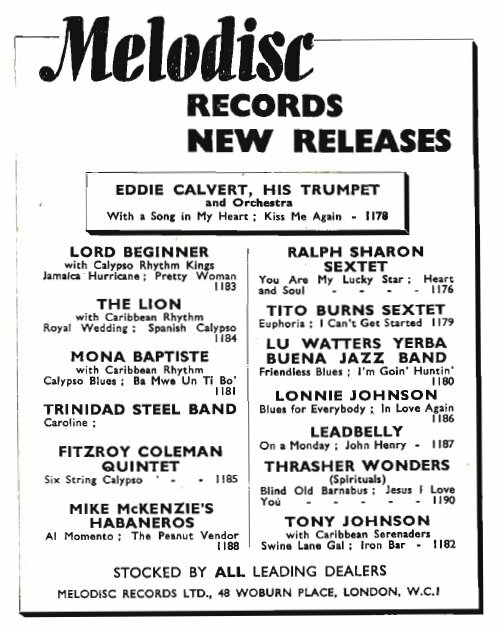 Denis’ name also crops up in the essential Honest Jons’ series London Is The Place For Me as the first man to record calypsos in the UK, with the likes of Lord Kitchener, and so on. The more I looked into this, the more I liked Denis. While there are plenty who question his technical abilities as a ‘recording supervisor’ there can be no doubts about his ability to put disparate elements and musicians together to see what happens. 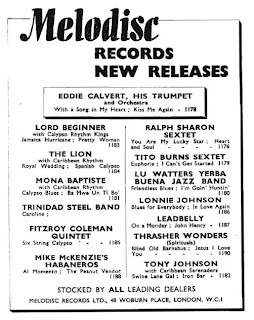 The absolutely perfect example of this than the sessions Denis ‘supervised’ where some of Humphrey Lyttelton’s traditionalists played with some of the West Indian jazz players who generally featured on London calypso recordings – and on this astonishing track from 1953 George Brown (Young Tiger) joins in the fun. 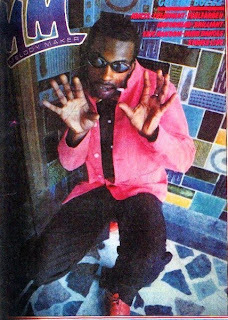 Another great example of Denis’ approach is where he got ex-pat US skiffler Johnny Duncan to record an adaptation of a calypso hit Last Train To San Fernando which features a wonderful latin-american guitar solo. 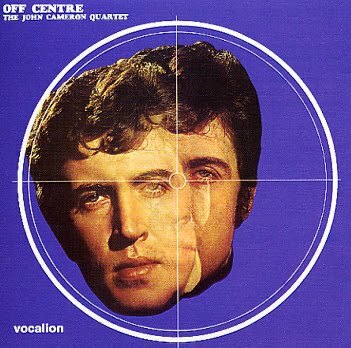 Johnny Duncan was initially reluctant, but the net result was what Nik Cohn called the greatest British rock ‘n’ roll record. Denis (with Joe Meek) was pretty important in recording skiffle and trad in the late ‘50s, and other delights including a couple of records with Ramblin’ Jack. But Denis was always a jazz man at heart. And he never really seemed to embrace ‘60s pop culture, though he was involved in some of the cracking theme tunes recorded by his old colleague Laurie Johnson, like the one for The New Avengers. 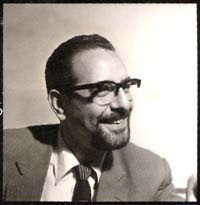 At the end of the ‘60s Denis Preston supervised the recording of a remarkable Laurie Johnson project, Synthesis, which brought the London Philharmonic Orchestra together with many of the top jazz players of the day. This suite is now available on a terrific (value) triple CD set called The Musical World of Laurie Johnson. 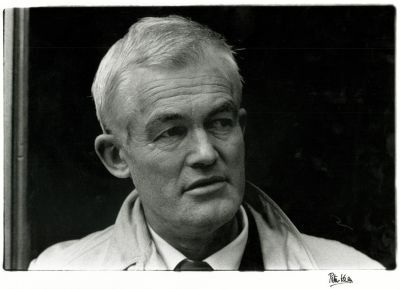 Among the players on Synthesis was the great Joe Harriott, who had a close working/recording relationship with Denis Preston from the early ‘50s to his tragic and untimely death in 1973. I have to confess I don’t know how the Fire In His Soul biography portrays the relationship between Denis Preston and Joe Harriott, but I have a very strong sense that the world of British jazz would have been far poorer and infinitely more dull without the presence of these great characters and visionaries. Preston one way and another (and these are only touched on and linked in Enlightenment!) helped in the recordings of talents such as Kenny Wheeler, Don Rendell, Ian Carr, Neil Ardley, and often put the players together with often startling results like the Hum Dono LP from 1969 which featured Joe Harriott with the Indian guitarist Amancio D’Silva, plus the always exceptional Norma Winstone on vocals. A review in Gramophone at the time described it as “an authentic piece of Indian-Caribbean-Occidental jazz! Records such as this prove that our music is still the only truly international folk music, with no language barriers.” Stephano’s Dance from that LP is a particular favourite. Kenny Graham features prominently in Enlightenment! - the current edition of YHO which can be downloaded here. He is someone whose name crops up occasionally in specific, discrete histories, but the overlaps are fascinating. Kenny is one of the most important figures in the development of British jazz music, as a saxophonist and as a composer. That national treasure Jonny Trunk has gone some way towards raising Kenny’s profile with the reissue of the fantastic Moondog and Suncat Suites, which features 1956 covers of compositions by the Viking of 6th Avenue and some of Kenny’s own compositions of a glorious homegrown exotica flavour. Trunk have also released a digital single of Kenny’s King’s Cross Climax from the Australian Suite he composed for the Ted Heath Orchestra. You’d be hard pressed to buy much else in the way of Kenny Graham product, except for some great tracks on an essential Sanctuary/Castle boxset of 1950s British jazz called Too Hot! Kenny Graham is acknowledged as one of the most open-minded of British jazz musicians. His compositions used elements of African, Caribbean and Latin music, and his groups (notably his Afro-Cubists) often featured musicians originally from Africa and the Caribbean. 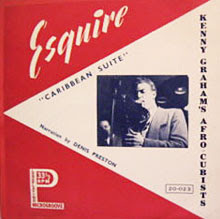 One of Kenny’s most revered recordings is his Caribbean Suite from 1953 (later covered by Harold Vick) which features the gloriously infectious track Bongo Chant, which over the years took on a life of its own and gradually mutated into Bangarang, the early reggae hit made famous by Lester Sterling & Stranger Cole. 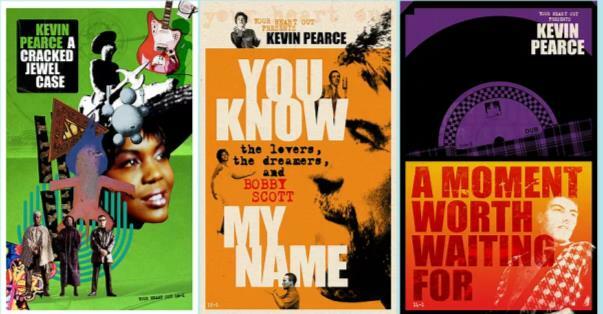 Kenny Graham also appears in the Colin MacInnes story, initially when the young writer Terry Taylor introduces his mentor to the sounds of Kenny Graham and his Afro-Cubists. MacInnes and Graham become friends subsequently, and work together on a musical drama which alas never got staged as events conspired against it. Kenny never really had much luck at all, and as ever the music business treated one of its truly gifted sons appallingly. He abandoned his sax, and concentrated more on composition. One of his finest moments came with the score for the 1963 Ken Hughes film, The Small World of Sammy Lee. This film features quite heavily in Enlightenment! and it links to many things, including Anthony Newley who put in such a great performance as Sammy. Colin MacInnes turned out to be pretty central to Enlightenment!- the current edition of YHO which can be downloaded here. I’m not sure what the world thinks of Colin MacInnes nowadays. You couldn’t , for example, borrow a Colin MacInnes book from any of my local libraries even if you wanted to these days. And that’s afore the cuts. Yet it was via my local libraries that I first got to read MacInnes’ London novels, with a little bit of timely prompting from Paul Weller 30-odd years ago. And what a revelation they were. Those, and the England, Half English collection of articles, were really important to me. That damned Julian Temple film of Absolute Beginners has a lot to answer for, and I suspect MacInnes’ stock fell as a consequence. The last time I saw him mentioned in a positive way was by Val Wilmer who recalled MacInnes’ friendship with the ‘father of modern Nigerian music’ Ambrose Campbell. MacInnes would frequent the Abalabi club in Soho where Campbell’s group was resident, and he was godfather to one of Ambrose’s children. I am still fascinated how, for whatever reason, MacInnes as a middle-aged man from a pretty privileged background became one of the first and best pop commentators. He captured important moments and expressed brave views in a way that can still delight. His best writing, however, is in Sweet Saturday Night, his late ‘60s examination of the Music Hall tradition, which is slightly ironic for someone whose reputation relied once relied on being at the cutting edge of contemporary pop culture. Anyone who has stumbled across my London songs project will have noticed how MacInnes’ Sweet Saturday Night and the Music Hall tradition form an important part of the content. The same goes for Enlightenment! where Music Hall is indelibly linked to themes like Unity Theatre, Lionel Bart’s work, early British rock ‘n’ roll, through to Alan Klein and the Small Faces. MacInnes’ genuine affection and enthusiasm for the songs and performers of the Music Hall is infectious, but he makes a good case for the way they created a genuine working class art form. Enlightenment! is the current edition of YHO which can be downloaded here. It seemed important when putting together Enlightenment! 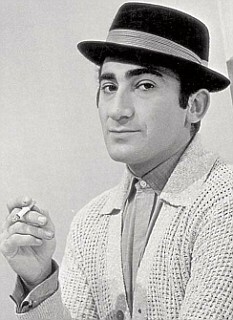 to emphasise how cover star Lionel Bart came from a Jewish East End communist background. As a young man he was involved with both Unity Theatre and Theatre Workshop, the two great British theatrical phenomena rooted in left-wing, working class, agit prop and the avant garde. If nothing else it is to be hoped that Enlightenment! encourages readers to seek Colin Chambers’ remarkable story of Unity Theatre and Joan Littlewood’s autobiography which is also a unique perspective on the history of Theatre Workshop. These are among the most inspirational stories in popular culture. 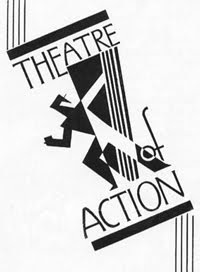 The pre-WW2 roots of these organisations are particularly important, and one of the best sources to read about origins is Theatres of the Left 1880-1935 which traces the story of the Workers’ Theatre Movements in Britain and America. Featured in this book is a fantastic account by Ewan MacColl of growing up in Salford and how he got involved with the theatre, how he met Joan Littlewood, and how their Theatre of Action (the precursor of Theatre Workshop) developed. The narrative is only 50-pages long but it packs an almighty punch, and it remains one of the most inspiring of reads. I do find Ewan MacColl a fascinating figure. I am aware of all the contradictions, and acknowledge the bloody-mindedness, pig-headedness, and his downright daft dismissals of this-and-that development within pop culture. Nevertheless his story is an incredible one, and I do think he is too often portrayed in far too simplistic and dull a way. Hopefully Enlightenment! highlights some of the more intriguing places where his story intersects with others. And for me one of the prevailing ironies is that for a man who had such contempt for what he saw as shallow, plastic polished pop music, he just happened to create some of the most beautiful and enduring of what can only be called pop songs which have been sung by people right around the world, often in contexts incredibly removed from their original settings. Ironically I have just started reading a (signed!) copy of Peter Cox's Set Into Song, borrowed with glee from a local drama college's library, which traces the stories behind the Radio Ballads of Ewan MacColl, Charles Parker and Peggy Seeger, and seems to feature accounts by many of the people involved in those incredible productions. We’ve mentioned how Lionel Bart’s ... Isn’t This Where We Came In? was the inspiration for Enlightenment! -the current edition of YHO which can be downloaded here. Among the many musicians that played on that remarkable record were Danny Thompson and Harold McNair, who emerged as heroes of Rob Young’s Electric Eden, one of the few books on music that doesn’t goad the reader into smashing up furniture. 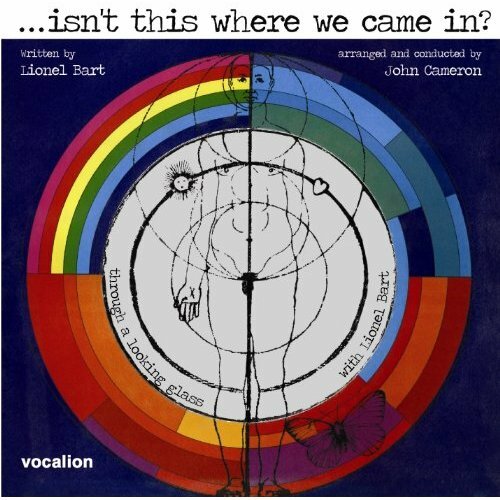 Thompson and McNair have well established connections to Bart’s musical director John Cameron that flow from their pioneering work together on Donovan’s Sunshine Superman. It would be fascinating to map the recordings these musicians were involved in between, say, 1966 and 1972 to track the permutations in which they appeared among the credits. As a general rule, though, you can’t really go wrong if any one of the above are featured. Those familiar with the YHO ethos will be aware how the project thrives on connections, particular where links are repeated and form a chain. And this works particularly well when it doesn’t matter where you start to trace the patterns. So, for example, Harold McNair and John Cameron worked together on the incredibly beautiful soundtrack for Ken Loach’s film adaptation of Kes. Cameron had worked together with Loach on his first screenplay, Poor Cow, which featured songs by Donovan. Cameron and McNair had already been working with Donovan. The screenplay for Poor Cow was written by Nell Dunn, drawing on her own novel. Loach and Dunn had worked together previously on the TV drama Up The Junction, which again drew on the original book by Nell. Enlightenment! is the latest issue of Your Heart Out, and it can be downloaded for free here. Save it, share it, print it, read it, discuss it. What's it all about? Jazz. Folk. Calypso. Music Hall. 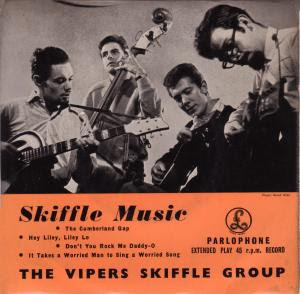 Skiffle. Blues. Ballads. Agit Prop. Highlife. Lowlifes. Beatniks. Modernists. Anarchists. Communists. Chancers. Charmers. Tormented Thinkers. Theatre Revolutionaries. Pop Pioneers. Cockney Visionaries . Soho Adventurers. You could say Enlightenment! is a work of assemblage. It draws together strands of history that overlap, intersect and get pleasantly tangled up. It links stories from detailed works of research that tend to focus on specific areas. It’s fun sometimes to take things apart and put them together in different ways. In other words, Enlightenment! is a jigsaw puzzle where the pieces may not necessarily all belong to the same box, but the picture they form will make a special sort of sense. The figure stands, a silhouette in the twilight, looking up at the castle and the garish glare of its artificial lights, listening to the sounds of distant revelries. As the rain falls, he kneels and lets a fistful of earth slowly sift through his fingers, head bowed as if in prayer. The guitarist’s left hand flails away as he leans into the microphone, neck muscles taut, and roars, seemingly summoning up hidden reserves of resentment, pent-up rage, and ancient wisdom. The bell tolls, the preacher returns to the pulpit for the sermon of his life, to speak out against the philistines behind the gates, to speak up for the indigent and indignant. There are precedents, naturally, but the sounds are unsurpassed. 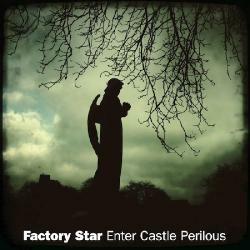 The cat scratch guitar and nor’ westerly wail can only belong to Martin Bramah, once of the Blue Orchids, and now fronting Factory Star who release the invigorating Enter Castle Perilous on Occultation Records. Disgust and desperation summon up inspiration. The Factory Star set is simply astonishing. For anyone sentimental about futures and pasts, there is plenty to appeal (ah! that organ sound), but that doesn’t even hint at the bile and beauty therein. What is it with these contrary quintogenerians? There is a sense of urgency to the Factory Star set. It was recorded in haste. And the ‘live’ feel suits the spirit of the occasion. It’s odd though how the hasty recording is a talking point. New technology is supposed to make things easier. But industry processes make things more convoluted and lifeless than they need be. And then the money men scratch their heads and worry about the cost of living. Take any great 50-year-old jazz recording, and it will have been recorded in a space of a few days. I seem to recall I first came across the name of Sun Ra in a Blue Orchids feature by Dave McCullough in Sounds. There was always something positively ancient about the Blue Orchids, drawing on folk melodies and pagan imagery when it really wasn’t the thing to do. At their most intimate and introspective they conjured up classics like The Long Night Out. And that mood is captured again by Martin on the achingly beautiful When Sleep Won’t Come, from the new Factory Star record. Oh it’s such a lovely song, an adult lullaby on the eve of a decisive battle. Some people don’t listen to music. They don’t need it in their lives. It’s an idea that’s hard to understand if much of your life revolves around music. Nevertheless the people who don’t listen to music seem to get by. I used to know someone who only listened to audiobooks. They had to spend a lot of time driving. And they would play tapes in their car, and all the tapes they played were audiobooks. They found the tapes relaxing. The voices helped them concentrate on the road, and proved to be good company. I rather liked that idea. I actually envied that simplistic approach to listening. I’ve never actually seen sales or circulation figures for audiobooks in cassette formats. For the blind and partially sighted they must be (or have been) a godsend. I assume tapes have been replaced by CDs or downloads to a large extent. But you do still see a lot of audiobooks on tape around. Charity shops, for example, tend to charge considerably more for an audiobook set of tapes than for a music one. And while the idea of sitting listening to an audiobook appeals, nearly all the tapes I see are Agatha Christie mysteries or comedy classics. I only have the one audiobook on cassette. Or to be more precise I only have one cassette of an audiobook. 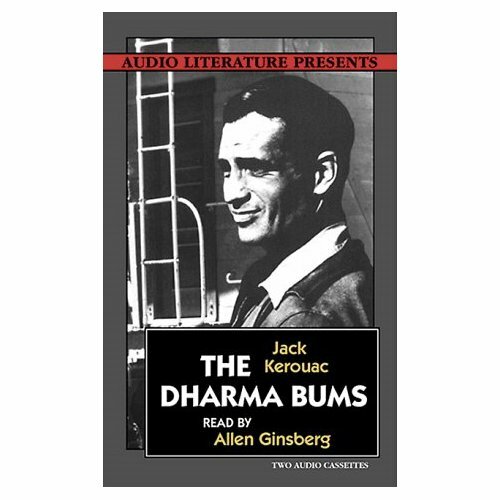 It’s parts 3 & 4 of Allen Ginsberg reading Jack Kerouac’s The Dharma Bums, recorded in 1991 by Audio Literature. I found it in a charity shop. I have no idea about what happened to the first tape in the set. I have never tried too hard to find the missing half either. I rather like the incompleteness. I love the one audiobook I have. I think Ginsberg is brilliant at reading Jack’s book aloud. He rattles through it at a rate of knots, but you can tell he’s thoroughly enjoying it. I can listen to this cassette and feel genuinely relaxed. It forms a fantastic background noise. It’s good company to have around you. I have no massive flag to fly for Ginsberg, nor a particular torch to burn for Kerouac. I haven’t read The Dharma Bums for 25-odd years. I don’t know if I’d enjoy it these days if I did. I have just realized, however, I am the same age Jack was when he died. 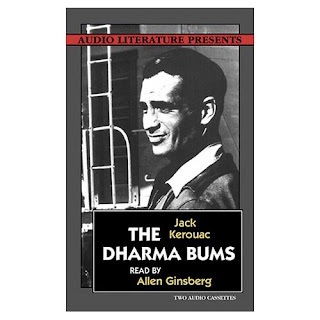 Listening to Ginsberg romping through The Dharma Bums I recall my reaction when I read the book for the first time. There were certain sentences that leap out and grab you. Ones you remember forever, or have to write down. I guess Morrissey felt the same way when he borrowed the “pretty girls make graves” line. One that sticks in my mind is where Jack is walking through deserted streets of an evening, aware of all the families sitting in their living rooms watching TV, and he sadly acknowledges that at least they’re not doing anyone any harm. Jack was capable of moments of great insight and compassion, and that more than all the holy goof nonsense was why I loved his work as a kid. Only recently online I came across an Allen Ginsberg Village Voice review of The Dharma Bums from November 1958 where his description of the book goes a long way to explaining why over 30-years on he clearly had such a ball recording it: “Spontaneous Bop Prosody, a nickname one might give to this kind of writing--that is to say, read aloud and notice how the motion of the sentence corresponds to the motion of actual excited talk. It takes enormous art (being a genius and writing a lot) to get to that point in prose. (And trusting God.) Bop because, partly, in listening to the new improvisatory freedoms of progressive musicians, one develops an ear for one's own actual sounds. One does not force them into the old rhythm. Unless one wishes to protect one's old emotions by falsifying the new ones and making them fit the forms of the old...” There is a strong spiritual, specifically Buddhist, core to The Dharma Bums, but it’s a sad book too in many ways. As Ginsberg said back in ’58, Jack was “weary of the world and prose.” You sense that’s why Jack’s summer job as a look-out up on Desolation Peak was so important to him, in terms of the challenge of being so alone for a couple of months. Thankfully I have that part of the book on the tape. As for Ginsberg himself, there are again certain lines that mean a lot. The one where he asks America why are its libraries filled with tears is one of the greatest things ever written. And I willingly acknowledge Ginsberg was there at so many important moments in history. It’s interesting what people choose as a Ginsberg 'pop' moment to identify with. For me, it would be where Tav Falco appends the opening lines of Howl! to his version of Leadbelly’s Bourgeois Blues. Or where Ginsberg adds vocals to The Clash’s Ghetto Defendant. There is a photo of Ginsberg with Joe Strummer and Mick Jones, taken shortly after Ghetto Defendant was recorded. I think it’s an astonishingly beautiful thing. I guess you could argue The Clash are rather like Kerouac and Ginsberg. They will always polarise opinion. They will always provoke strong emotions for and against. I was reading a piece recently relating indirectly to the Combat Rock-era, where the well-connected writer oh-so-boldly adopts a stance that could be interpreted as: “Oh I don’t like The Clash as they embody the ‘long live rock ‘n’ roll’ last-gang-in-town macho mythology”. But even a casual listen to Combat Rock, and in particular the second side, reveals surely a strange, haunted, vulnerable, adventurous set of songs which defy categorization? It was, after all, merely a couple of years from Combat Rock to The Smiths, which still feels like slipping back into a suffocating rigid orthodoxy. 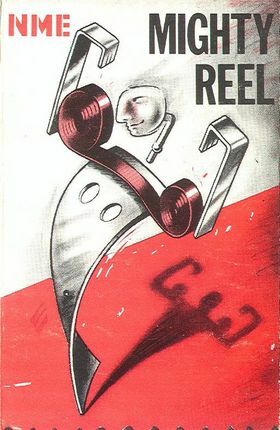 The Mighty Reel is perhaps not the most well-known in the NME’s series of tape compilations, but this 1982 collection is the best one the paper put out. It’s billed as “1982 – the case in favour.” It puts forward a great case. And 30-odd years on, it retains the power to get me scurrying off to seek out more by certain of the artists featured. So, for example, the inclusion of Sleep Talk by Ornette Coleman got me listening to his 1982 LP Of Human Feelings, and becoming quite obsessed by it. I certainly never heard it at the time. I doubt I even saw it. But listening to it now it seems almost perfectly to feature the ‘active background music’ the Fire Engines were itching to get together. I don’t know how this record is regarded by real Ornette-thologists, but it seems pretty perfect just now, striking a balance between melodic jazz funk/functional fusion and something more punk and unsettling along the lines of the Contortions. The track on Mighty Reel that really caught me unawares was Fashion’s White Stuff. I had totally forgotten about Fashion. I can’t say I’ve seen their name mentioned in years. But White Stuff had me searching for, and falling in love with, Fashion’s Fabrique LP. The ‘owner’s manual’ that came with the Mighty Reel sums it up pretty neatly: “Last year’s ugly ducklings, this year’s beautiful swans, Fashion confounded everyone except themselves with the depth and durability of their Fabrique album, produced by German studio whizz Zeus B Held.” Ah yes, Zeus B Held, of Gina X fame (who guests on the superb Love Shadow), who did Win’s Freaky Trigger, Chas Jankel’s Looking At You (and Chas’ solo LPs are an excellent reference point), Pete Wylie’s Sinful, etc. The fascinating thing is that Fabrique doesn’t sound like the suffocating records their Horn-rimmed contemporary glossicists were coming up with. It’s a really smooth, almost scarily adult-orientated disco/rock sound they came up with, with lots of space, which has aged really, really well. It was a remarkable transformation for what were Birmingham post-punk also-runs famous more for their hair than their flair. The track that made me stop and hold my breath was The Ravishing Beauties’ Futility. It’s Virginia Astley’s adaptation of a Wilfred Owen poem, and her angelic chorister’s delivery adds a macabre twist to the studied beauty of the arrangement. Hearing it again made me listen anew to Virginia’s From Gardens Where We Feel Secure, and imagine vividly the sinister undercurrents which Michael Bracewell almost hints at in England Is Mine. The music may be an elegy to a lost English pastoral romanticism, but what are the circumstances in which the ‘dreams’ of this arcadia are taking place? It is a little like J.L. Carr’s A Month In The Country in some ways. It also makes me want to go and read some Denton Welch. Do people still read Denton Welch? They should. Futility was I think the only ‘official’ recording released under the name Ravishing Beauties. There was a Peel session, too. And I seem to remember Nicky Holland going on to work with the Fun Boy Three, who are also featured on the Mighty Reel with The Alibi. The FB3’s recordings still sound ridiculously underrated, and what they came up with in such a brief space of time seems remarkable, in terms of the music and lyrical content. There is a strong and very welcome non-UK/US presence on Mighty Reel. The new European pop is represented brilliantly by Yello, Liaisons Dangereuses and The Honeymoon Killers. And what was then a lively interest in African pop was reflected by the inclusion of the JuJu sound of King Sunny Ade and a track from Rough Trade’s Soweto compilation. Demonstrating how the African influence was working at the time, Weekend contribute an exclusive ‘live’ take of their highlife flavoured A Day In The Life Of ... (as opposed to A Life In The Day Of ...), which still sounds glorious and is a useful reminder of how much ground Weekend covered on the classic La Varieté. Their Rough Trade label mate Robert Wyatt contributed what was then an ‘exclusive’ and totally gorgeous recording of jazz standard ‘Round Midnight. The second in the NME’s long-running series of tape compilations was Jive Wire. It was trailed as being “21 choice tracks by the cool, hot and crazy soundmakers of 1982, collected on cassette by the world’s sharpest music read, New Musical Express.” 30-odd years on it’s striking how well it is put together. The running order was clearly given some careful consideration as there is a definite flow to proceedings. Ironically, this programming adds to a sense of things falling apart in terms of a music scene becoming more factionalised. I can remember at the time feeling a sense of “oh yeah this-and-that selection of tracks are for me” while simultaneously feeling a definite sense of hostility towards certain other sounds/stances that were represented. What I felt particularly enthusiastic about was the jazz related sounds, and particularly the sequence that went Defunkt, Rip Rig & Panic, Carmel, and Vic Godard. Those tracks were the ones I would return to, and feel a sense of affinity with. These were, after all, still sternly anti-rockist times, and jazz in all its guises and with all its connotations was emerging as an ideal alternative. Vic Godard was very much my hero at the time, resplendent in his tuxedo and bow tie, coolly clicking his fingers as he crooned for us hipsters. And Carmel who is featured with the magnificent Storm was the epitome of boho cool at the time, coming from an awkwardly avant-garde background but creating compellingly haunting music as a group with those incredible vocals to the fore. The Jive Wire cover design was illustrated by Serge Clerc, who would do a lot of work for the NME in the early ‘80s. Along with Mark Wigan and Ray Lowry he was the illustrator of the day. His particular emphasis was on a retro-futurist cool featuring be-quiffed young men in zoot suits and spats, playing saxophones, dancing with beautiful beat angels. He would appropriately go on to design the distinctive cover for Carmel’s debut LP The Drum when it finally appeared, produced by Mike Thorne of Wire fame. The sections of Jive Wire I really felt uncomfortable with were the glossy ‘new pop’ parts where it felt like there wasn’t any room to breathe. In particular, it was the born-again glossicists that got to me: Thompson Twins, and Leisure Process which was the vehicle for the occasional Sounds writer Ross Middleton, a fervent evangelist for the ‘new pop’ movement. Ironically it would be David Gamson, who would later be an integral part of Scritti, who showed how the new funk could be done, with the stunning No Turn On Red. Gamson by this stage had already released a single on Rough Trade, albeit one (a radical electro re-imagining of Sugar Sugar) I believe which was rejected by Ze. No Turn On Red, nevertheless, in many ways sounds like the consummate Ze delight, almost too much so. Scritti are also represented, with the glorious reggae knees-up Asylums in Jerusalem. It is one of my favourite Scritti moments, though I confess it’s more to do with the simple pleasures of Green singing “Let him hip hop hippity hop ...” I seem to remember The Raincoats having a similar line. Reggae is also represented here by Black Uhuru and by Aswad. The latter’s Ghetto In The Sky features a fantastic dub. There is a strong dub influence too in the funk/soul stylings of Buzzz whose Tonight’s Alright is an exclusive to the cassette. It’s an astonishingly good track. Buzzz released a few singles in 1982, got on the cover of Melody Maker, but you really get the impression they were too far ahead of their time. They were essentially reggae guys who’d played with Rico, for example. The singer was Dee Sharp who remains revered in UK lovers rock circles. He was, I believe, the first person to release a single on the legendary London label Fashion with the glorious Let’s Dub It Up. The more primitive r‘n’r urges are catered for by Tav Falco’s Panther Burns and the Gun Club, and there can be no denying that the Americans were so much better at this than any UK counterparts. Theatre of Hate, whose Dreams of Poppies is included, really were never in the same league, but they were nevertheless a strange outfit with a remarkable underground following rather like Adam and the Ants had before the pop makeover. The closing track on the tape is Madeleina by Congolese soukous star Pablo, or to give him his proper name Pablo Lubadika Porthos. The full version of this was released as a 12” by Island, and judging by comments on the internet this track was for many people the entry point for investigating African sounds. It certainly sounds glorious, even now. And Island at the time, in its inimitable way, played an important part in promoting the music being made in Africa at that time.